Thomas Exchange gives you BETTER RATES than The Post Office, Marks & Spencer, Travelex, Thomas Cook, and High Street Banks. We update our exchange rates daily and at any time during the day when there are major movements in the foreign exchange markets. advance for fast-track payment and collection at our London offices (see maps). Thomas Exchange will deliver Banknotes anywhere in the UK with Royal Mail Special Delivery. Thomas Exchange can deliver to any office within the City of London and Canary Wharf. Our twice daily service guarantees delivery from 10am to 1pm (morning round) or from 1pm to 5pm (afternoon round). This service can only be arranged by telephone so please contact Thomas Exchange on 020 7256 7457 for an instant quote on any currency. Thomas Exchange can convert your foreign currency into GBP Sterling at unbeatable rates and 0% commission. We accept €1 and €2 coins. Take advantage of our highly competitive exchange rates around the world. Available anywhere in the UK via Royal Mail 1st Class Delivery. Available at our City and Oxford Circus offices immediately in Euros and US Dollar. Convenient - accepted in 32 million locations in 200+ countries worldwide. No charge for purchasing your prepaid currency card on initial loads over £500. 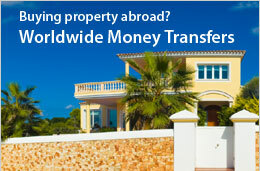 Thomas Exchange can make your foreign payments easier! Thomas Exchange are specialists in the payment of funds throughout the world, at much better rates than High Street banks. Please be aware that receipt of funds from Thomas Exchange UK Ltd into your nominated bank abroad or within the UK may result in charges being applied by the receiving beneficiary bank. For details of any charges applied by the receiving bank please contact your bank directly. Thomas Exchange offers SPECIAL EXCHANGE RATES to transfer amounts of £5,000 or more into Euros or US Dollars. Please call one of our traders.